Home » Verti Shelving Lifts 15" - 39"
Verti Shelving Lifts 15" - 39"
The Verti Kitchen Cabinet shelf lifts raise and lower cupboard shelves smoothly and quietly, so the contents of the cupboard can be accessed from a seated position, creating accessible kitchen cabinets in your home. 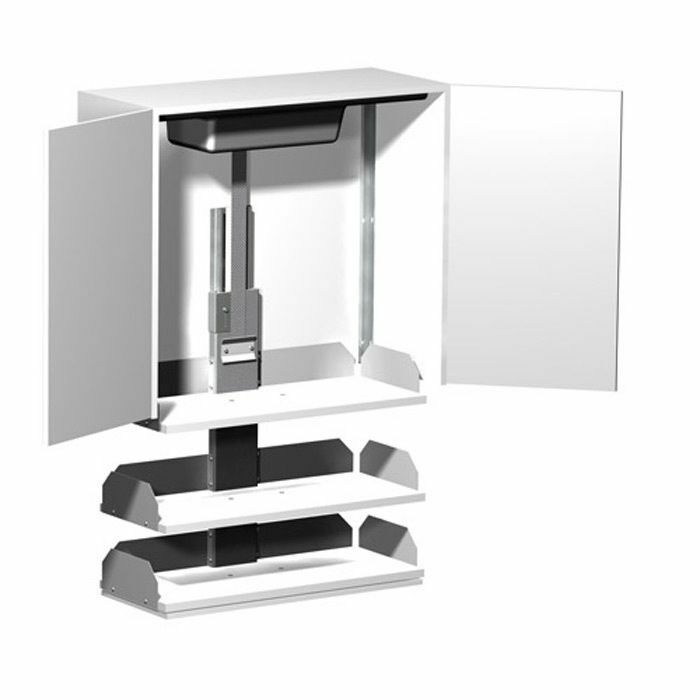 The Vertical Shelf lift is one of the easiest systems to incorporate into your wheelchair accessible kitchen, as it can fit inside most new or existing cupboards without having to extend them out from the wall. All you have to do is remove the existing shelves and bottom of the cabinet before installing, and you will have universal design kitchen cabinets. Designing ADA kitchens to meet the needs of all family members is now easier with the Verti electric shelf lift from Freedom Lift Systems. ADA kitchen cabinets are accessible to every person who uses the kitchen and now you can have them in your home, without major renovations. Vertical shelf lifts are made by Granberg in Sweden. 830-09001 35.5"/90cm wide Verti Shelf Lift 32"